Israel’s first kosher whisky, produced by Tel Aviv’s Milk & Honey distillery, is to be auctioned next month. Only 100 bottles of the distillery’s first single malt, which has been aged for three years in virgin American oak and ex-Bourbon casks, will be auctioned via Scottish website www.whiskyauctioneer.com. The public auction will begin on 11 August and run for 10 days, ending on 21 August. The remaining bottles, of which there is a ‘limited inventory’, will be available to purchase from selected stores throughout Israel. The expression, named Israel’s First Single Malt Whisky, was produced under strict kosher conditions overseen by the Tel Aviv Rabbinate. Distillation was conducted at Milk & Honey’s original site at a kibbutz in the Sharon region in January 2014, before the operation moved to its current location in Tel Aviv. The whisky’s production was overseen by head distiller Tomer Goren and late distilling consultant Dr Jim Swan, who worked to established many distilleries around the world, including Kavalan in Taiwan and Kilchoman on Islay. The distillery describes its first release as being ‘mature and complex for its age’, with notes of lemon and orange zest and a ‘delicate woodsy taste’. Israel’s First Single Malt will be sold as part of Milk & Honey’s ‘experimental series’. 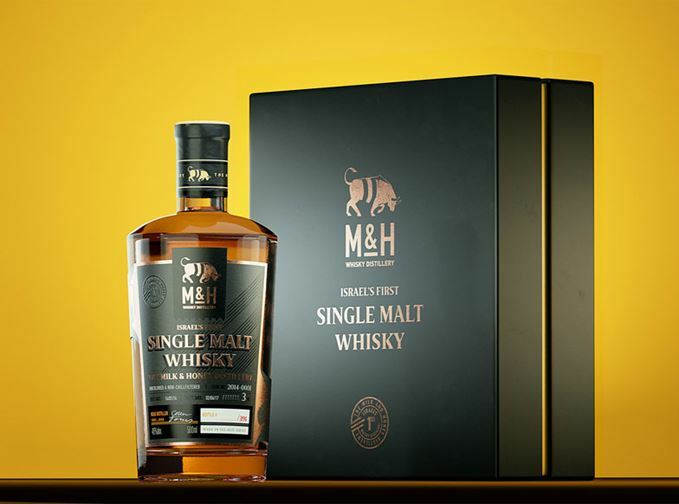 Milk & Honey will release its Founders’ Edition single malt, already sold out on allocation through a crowdfunding campaign, in 2019. Buy a ticket for the charity raffle and you could win over £2,000 worth of whisky.